In his sweeping vision of human history (or, from Nephi’s perspective, human future), Nephi divides all people into “save two churches only; the one is the church of the Lamb of God, and the other is the church of the devil” (1 Nephi 14:10). Such a dichotomy is a common theme in the Book of Mormon, and is an indispensible aspect of early Judeo-Christian literature, dating back to Lehi’s time (see Jeremiah 21:8). This can be easily misunderstood to insinuate that anyone who is not a Latter-day Saint is of the church of the devil, and therefore evil. Here, I would note the interpretation of these two symbols by several scholars, which suggests that the picture is much more complex. The first thing Nephi sees in this phase of the vision is the formation of a “great church … a church which is most abominable above all other churches” (1 Nephi 13:4-5). Few symbols in Latter-day Saint scripture have been more thoroughly misunderstood than Nephi’s “great and abominable church,” also called “the church of the devil” (1 Nephi 14:9-10). Sectarians who are uncomfortable with the Latter-day Saints have invariably taken this as reference to themselves and their churches, and all too often Latter-day Saints have only added to this misperception. The word church (Hebrew qahal or edah; Greek ekklesia) had a slightly broader meaning anciently than it does now. It referred to an assembly, congregation, or association of people who bonded together and shared the same loyalties. Thus the term was not necessarily restricted to religious associations…. When we put all this together, we find that the term great and abominable church means an immense assembly or association of people bound together by their loyalty to that which God hates. Just as there are Latter-day Saints who belong to the great and abominable church because of their loyalty to Satan and his lifestyle, so there are members of other churches who belong to the Lamb because of their loyalty to him and his lifestyle. Membership is based more on who has your heart than on who has your records. Later in the same vision, Nephi sees that the earth will be overwhelmingly wicked, but that the few Saints will be all around the world, and that they will be strengthened by the Lord in a great struggle with the forces of evil (see 1 Nephi 14:9-16). It is at this point that Nephi introduces the antithesis to the great and abominable church – the church of the Lamb of God. wherefore, whoso belongeth not to the church of the Lamb of God belongeth to that great church, which is the mother of abominations; and she is the whore of all the earth. And it came to pass that I looked and beheld the whore of all the earth, and she sat upon many waters; and she had dominion over all the earth, among all nations, kindreds, tongues, and people. Nephi introduces the church of the Lamb with a detailing, a type of parallelism that makes an introductory statement, which is by itself complete, and then follows it up with statements that provide more details, principally answering a question of either who, what, which, why, where, or how. In this case, the introductory statement yields the information that there are only two churches, and the follow up statements identifies what those churches are. Just as with the great and abominable church (identified here as “the church of the devil”), the church of the Lamb is typological, and includes more than just the Church of Jesus Christ of Latter-day Saints. Casey Paul Griffiths writes, “Membership in the church of the Lamb in this [typological] context expands beyond denominational lines to include all who genuinely strive to do good according to the light they have been given.” He further states, “This allows us to recognize righteous individuals outside of our own faith who will stand in opposition to the work of the church of the devil. By this standard there are members of all faiths who may reside within the church of the Lamb of God…. By this standard, membership in the church of the Lamb is based on the desires of your heart, not just on which church you attend.” Just as the great and abominable church is an embodiment of all that is evil, so the church of the Lamb is an embodiment of all that is good. · The Church’s numbers were few and dominions small (see 1 Nephi 14:12). · The Church’s members were scattered upon all the face of the earth (see 1 Nephi 14:12, 14). · Nephi saw the power of the Lamb descend upon the Saints of the Church and beheld that they were armed with righteousness and power of God in great glory (see 1 Nephi 14:14). These few phrases give a marvelous description of the place and function of the Church in the last days. Griffiths goes on to demonstrate that these are the exact conditions of the LDS Church at present. The extended alternating parallels of verse 12 (see above) serve to emphasize the predicament of the church of the Lamb: it will always be few in number and small in power, and this will be because of the wickedness of the great and abominable church (or “whore,” as it is identified in this passage). Griffiths notes, “From a prophetic point of view, obstacles to Church growth come directly from the followers of the adversary.” Today the Church faces opposition in the public sphere from various advocacy groups who deliberately seek to tear down the Church. Hence, it is presently just as Nephi described. The two symbols—the church of the Lamb and the church of the devil—symbolize, typologically, the forces of good and evil. As I noted in the introduction, such dichotomies are typically of ancient Judeo-Christian literature. “This kind of scriptural writing is meant to remind us of the struggles between good and evil that have happened throughout the earth’s existence.” That struggle continues today, and Nephi is speaking of the world we currently live in. In giving us only two options, Nephi challenges us to pick a side. Like Joshua, he leaves us to “choose you this day whom ye will serve” (Joshua 24:15), and like Christ, he insists that we cannot serve both (Matthew 6:24; Luke 16:13). We live in a world where we must choose; “as for me and my house, we will serve the Lord” (Joshua 24:15). See commentary in Brant A. Gardner, Analytical and Contextual Commentary on the Book of Mormon, 6 vols. (Salt Lake City, Utah: Greg Kofford Books, 2007-2008) 1:247-248. 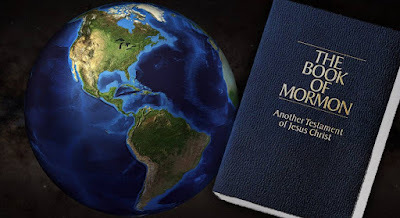 In all fairness, it has not been unheard of for sectarian anti-Mormons to equate the Church of Jesus Christ of Latter-day Saints with the “Babylon,” “the great whore,” and “mother of all harlots” in John’s Revelation, which represents the exact same thing as the “great and abominable church” (see discussion in the body of the text). The pejorative use of scripture symbols goes both ways. See Stephen E. Robinson, “Nephi’s ‘Great and Abominable Church’,” Journal of Book of Mormon Studies 7/1 (1998): 32-39; also see Stephen E. Robinson, “Great and abominable church,” in Book of Mormon Reference Companion, Dennis L. Largey et al., eds. (Salt Lake City, Utah: Deseret Book, 2003), 310-315; Stephen E. Robinson, “Early Christianity and 1 Nephi 13-14,” in First Nephi: The Doctrinal Foundation, Book of Mormon Symposium Series: Volume 2, Monte S. Nyman and Charles D. Tate Jr., eds. (Provo, Utah: BYU Religious Studies Center, 1989; reprint Greg Kofford Books, 2007), 177-191. Robinson, “Nephi’s ‘Great and Abominable Church’,” 34-35; Robinson, “Great and abominable church,” 311; Robinson, “Early Christianity,” 179. Dennis A. Wright, “Great and Abominable Church,” in To All the World: The Book of Mormon Articles from the Encyclopedia of Mormonism, Daniel H. Ludlow, S. Kent Brown, and John W. Welch, eds. (Provo, Utah: FARMS, 2000), 114. Robinson, “Nephi’s ‘Great and Abominable Church’,” 34; Robinson, “Great and abominable church,” 311; Robinson, “Early Christianity,” 178. Bruce R. McConkie, Mormon Doctrine, 2nd ed. (Salt Lake City, Utah: Deseret Book, 1966), 137-138. Rodney Turner, “The Prophet Nephi,” in First Nephi: The Doctrinal Foundation, BMSS 2:88. Casey Paul Griffiths, “The Church of the Lamb of God,” in The Things Which My Father Saw: Approaches to Lehi’s Dream and Nephi’s Vision, The 40th Annual Sidney B. Sperry Symposium, Daniel L. Belnap, Gaye Strathearn, and Stanley B. Johnson, eds. (Salt Lake City, Utah: Deseret Book and BYU Religious Studies Center, 2011), 45. Robinson, “Nephi’s ‘Great and Abominable Church’,” 37-38; Robinson, “Great and abominable church,” 314; Robinson, “Early Christianity,” 184. Griffiths, “The Church of the Lamb of God,” 45. Robert E. Parsons, “The Great and Abominable Church,” in The Book of Mormon: Part 1 – 1 Nephi-Alma 29, Studies in Scripture: Volume 7, Kent P. Jackson, ed. (Salt Lake City, Utah: Deseret Book, 1987), 47. For the structure of this passage used here, see Donald W. Perry, Poetic Parallelism in the Book of Mormon: The Complete Text Reformatted (Provo, Utah: Neal A. Maxwell Institute, 2007), 29-30. See Perry, Poetic Parallelism, xxxiii. Griffiths, “The Church of the Lamb of God,” 45, brackets mine. Griffiths, “The Church of the Lamb of God,” 40-41. None of this should be taken to mean that these same things cannot be said of non-members, who are part of the church of the Lamb in the typological sense. Griffiths, “The Church of the Lamb of God,” 41-44. Griffiths, “The Church of the Lamb of God,” 42. Griffiths, “The Church of the Lamb of God,” 47. Griffiths, “The Church of the Lamb of God,” 39. Great insights! It is frustrating to me as a Mormon that very well-known Mormons have contributed to the misperception of what the Church of the Devil is that Nephi sees. I agree that it is frustrating when some among us promote that misconception. Part of why I wrote this up. I found it interesting while I was reading through the Book of Mormon student manual when it discusses 1 nephi 13:4-9 that the word church has a deferent meaning to The Lord. In his view church means kingdom. It states we often refer to the church of Jesus Christ of Latter Day Saints as the kingdom of god. If we liken the great and abominable curch to the kingdom of the devil it clarifies his dominion and what is meant. To your point it can be anything that the devil has influence over. It is not exclusive to actual church originations as we see now. As a former LDS, are you suggesting in your article that the LDS church is not the only way to God's presence (eternal salvation) but that any who serve God and fellow man - through their humble and godly heart - are in the Church of the Lamb? +Orin Porter, I am a fully active member of the LDS church and if you don't mind, I you like to give you MY personal opinion. We came here to earth to progress. We progressed as much as we could in the pre-earth life and needed bodies to continue our progression. This is what is the most important thing we can do on this earth: BECOME BETTER. With that in mind do you need to be a member of the Church of Jesus Christ of Latter-day Saints to become better? Of course not! The church has a lot of things that will help one become a better person, but one can become a better person without the church. The God's church was not on the earth for hundreds of years and there are billions of Gods children that were not members of His church yet it will be alright for them. What each of us need to do is try and be better people, love our families a little more, help those in need, forgive those that hurt us, smile at strangers...these things are SO much more important than what church you go to. I think when we all are in front of God to be judged, it will be more of a comparison of what type of a person we are now and what we were before we came to earth. It will not be an analysis of what church we belong to or where or when we lived.